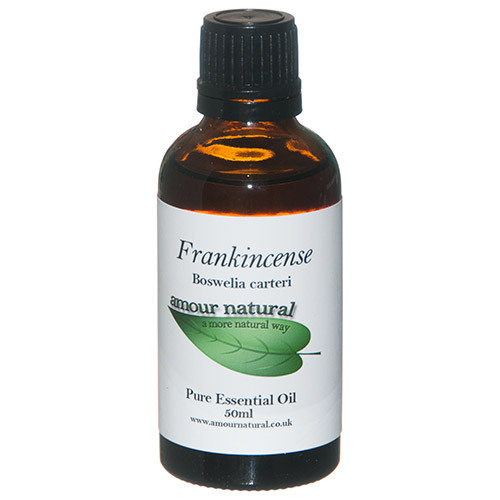 Frankincense is a calming oil which may be used to relax those with anxious dispositions. The oil is also renowned for rejuvenating mature skin properties, reputedly smoothing out wrinkles and helping with the appearance of age spots. The oil is slightly astringent, which is also good for balancing oily skin. This astringent nature of frankincense is also good for clearing mucus in the lungs. Frankincense essential oil is taken from the resin of the tree’s bark. To access the resin, incisions are made in the bark and it drips out in ‘tears’. This resin is then distilled to produce the essential oil. Frankincense oil blends well with lavender, sweet orange, geranium, patchouli, bergamot, lemon and myrrh. Avoid use if you are pregnant. If you have a medical condition, consult a practitioner before use. Below are reviews of Amour Natural Frankincense Pure Essential Oil - 50ml by bodykind customers. If you have tried this product we'd love to hear what you think so please leave a review. Enchanting fragrance and a wonderfully therapeutic oil. worth sourcing Aromas from reputable source and once again bodykind have proved reliable. Real frankincense haunting aroma! Another fine quality aromatherapy oil and one of my favourite essential oils! Although Frankincense is one of the more expensive oils, it is well worth its beautiful fragrance and aromatherapeutic benefits. Very happy with my purchase especially with receiving a nice discount too! Once again, thank you for a great service!